Hagerman Fossil Beds is a candidate for the least well-known national monument in the West, perhaps competing for this title with other paleontological preserves like Fossil Butte in Wyoming and Florissant Fossil Beds in Colorado. 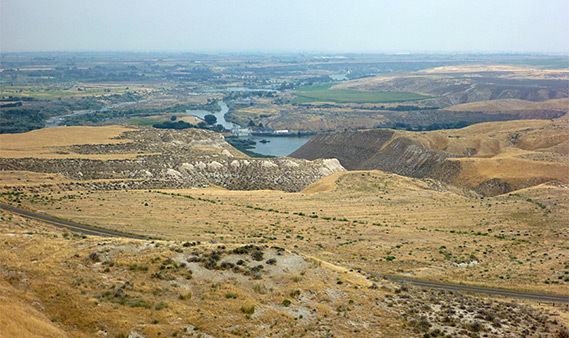 The national monument covers a thin strip of land extending six miles on the west side of the Snake River, where this is dammed forming Lower Salmon Falls Reservoir. The visitor center for the monument is located in the nearby small town of Hagerman, on the east side of the river, along US 30, which meets I-80 eight miles north and also passes close to the various units of Thousand Springs State Park. Most of the Snake River in this part of Idaho flows over volcanic rock, but near Hagerman the surrounding cliffs are sedimentary, dating from the late Pliocene period, and have proved very rich in both plant and animal fossils (especially a zebra-like creature known as the Hagerman horse), but, as is usually the case for such locations, there are no fossils to be seen in situ, only in the museum at the visitor center. 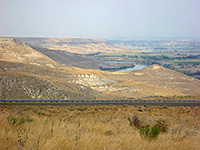 Instead, developed sites in the monument are limited to two overlooks, one of the river, the other of a section of the historic Oregon Trail. A quiet, country backroad (Bell Rapids Road) winds through the southern section of Hagerman Fossil Beds National Monument, forking off US 30 a few miles south of Hagerman; this crosses the Snake River, passing close to Upper Salmon Falls Dam, then reaches the first viewpoint, looking out over the widest part of the reservoir. Downstream, the river is bordered by flat land to the east (Hagerman Valley) but steep, layered cliffs to the west, which extend northwards for a little way beyond the monument boundary and are cut by several narrow gullies. All the land hereabouts is completely treeless, covered only by short grass, so the bedrock is exposed in many locations, making fossil hunting very fruitful. The excavation sites are not open to the public however, and cross-country hiking is not allowed, supposedly because of the dangers of rattlesnakes, scorpions and landslides, but perhaps also to discourage fossil hunters. Several major landslips have occurred over the years, down the cliffs west of the river, some of which are visible from the viewpoint. Past the view of the reservoir, the road climbs to the plateau on top of the cliffs, moving away from the river, and reaches Oregon Trail Overlook, an elevated viewpoint surrounded by rolling, grassy hills and valleys. The course of the Oregon Trail is evident below, mostly staying close to the road, and a 3 mile section between the two viewpoints is open to hiking, though very few people do so. But the short walk from the parking area to the edge of the largest valley is worthwhile, looking down along several miles of the trail to the Snake River beyond. The only other public access in the national monument is along a partly unpaved road that forks north, then back east, to another trailhead, from where an old vehicle track winds down a ravine through the cliffs to the edge of the river. The monument is bordered by a limited area of private land to the west, then beyond stretches a vast, undeveloped part of the state that extends over 200 miles into Nevada and Oregon, and contains virtually no towns or paved roads.